I guess my daughter doesn't want a loft bed. She was just humoring me. What a sweetie. She does really want a day bed, or a bed that looks like a couch. I have found a couple cute ideas online. This one I found on the Country Living website I could probably find two matching headboards at D.I. if I looked often enough. I'm not sure if I like the pads on the inside. I'm thinking some of those round pillows will work for cushioning. This one is from the Apartment Therapy site. 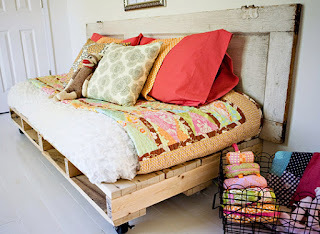 It looks so easy to make and has some rustic charm. I'm not so sure it will work for what she wants in her room though.